...... Every desktop and cursor activity, including keystroke typing, some window or program opening or closing, website browsing, IM chatting and all other PC activity will be captured and all of these can display incessantly in the video recording files just like a movie. With this screen recorder monitor, you can view clearly what others do on your computer when you are away; or you can know what your employees do at their working hours. For more invisible monitoring, this screen recording software was made in hidden when it works. There is no trace in Add/Remove Programs, Start menu, Application, and no icons or shortcuts in the desktop or right lower corner of the screen. So Spy Monitor Screen Recorder also is a surveillance camera to monitor incorrect computer activity of the employee, the child or cheating spouse. Qweas is providing links to Spy Monitor Screen Recorder 3.1 as a courtesy, and makes no representations regarding Spy Monitor Screen Recorder or any other applications or any information related thereto. Any questions, complaints or claims regarding this application Spy Monitor Screen Recorder 3.1 must be directed to the appropriate software vendor. 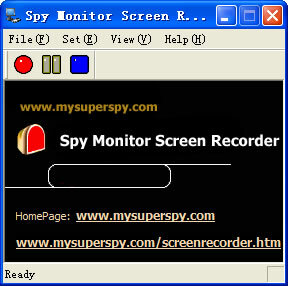 You may click the publisher link of Spy Monitor Screen Recorder on the top of this page to get more details about the vendor.